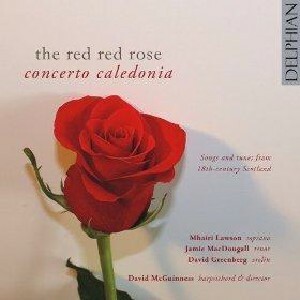 The Red Red Rose, The Scottish Music Shop - The Best Selection of Scottish CDs and Scottish DVDs. Featuring the 1st ever recording of the original version of Robert Burns's most famous love song The Red Red Rose, to the tune by Italian singer Pietro Urbani. Supreme playing & singing, and with a strong sense of levity. Concerto Caledonia obviously take their music seriously, but not so themselves - there's passion and perfection here, but no pomposity.